Welcome to Disney Extinct Attractions. 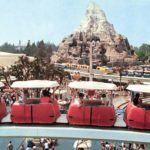 My name is Cole, and today we’ll be revisiting the first post I ever wrote in honor of a very famous Imagineer. A few Sundays ago (on September 10th, 2017), Imagineer X Atencio passed away at the age of 98, living a long and fulfilling life. Starting his time as an artist within the company, X gradually made his way into Imagineering and wrote the scripts for a couple little attractions known as Pirates of the Caribbean and the Haunted Mansion. He also wrote the script for another attraction that used to be in Tomorrowland and just happens to be my favorite extinct attraction. 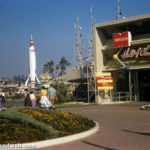 During the middle of the 1960s, Disneyland’s Tomorrowland was slowly turning into Todayland. The whole atmosphere of the land began to feel outdated, leaving park guests wanting more. Since 1957, Walt, with his mind on expanding the park, had been thinking of adding in a pseudo-extension to Tomorrowland known as Science Land, alternatively known as Adventures in Science. One of the headlining attractions of this land would be known as “Micro-World,” a journey where guests would sit on protozoa and travel through a drop of water. Slowly but surely, Walt got consumed by other ventures such as the Florida Project and the 1964 World’s Fair, and Science Land began to fall by the wayside. But the idea for Micro-World stayed locked away in the Imagineers files as a project for another day. That day finally came when Walt, fresh off his massive success at the World’s Fair, saw Tomorrowland and knew that it needed an upgrade. Having not added an attraction in the past six years, Tomorrowland was in great need of the innovation that the land prided itself upon. Hence, New Tomorrowland 1.0 was born. With this restructuring, it was finally time to bring Micro-World into the fold of Disney attractions. 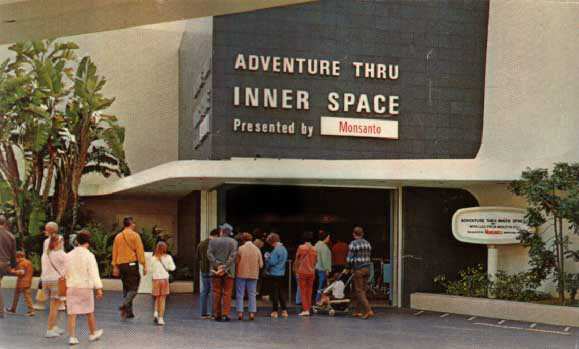 Rebranded as Adventure Thru Inner Space, the attraction opened on August 5th, 1967, along with the rest of the new and improved Tomorrowland. If that building looks familiar to you, it’s because it currently houses Star Tours – The Adventure Continues at Disneyland Resort. As you can see, the attraction was presented by Monsanto, a sustainable agriculture company, which also sponsored such attractions as The House of the Future and The Hall of Chemistry. One note about the Hall of Chemistry is that it gave some guests their first look at atoms and the molecular structure of compounds. These were not yet commonplace things to learn about in school, so the public was still astounded to learn more these newly popular things. Adventure Thru Inner Space took that one step further by taking you inside a water molecule, giving guests a first-hand look at the molecular structure that compound. I’m not going to dive deep into the story because I do not want to spoil it for those who want to watch the virtual ride through of the attraction found below, but a brief synopsis is that you travel through the Mighty Microscope and slowly shrink smaller and smaller while examining a snowflake. Throughout the journey, you begin to see more of the molecular structure as you dive further into the structure of the water molecule. The virtual ride through is actually an amazing resource that I cannot recommend enough. You feel like you experience the whole attraction and its design is fantastic. That being said, the actual attraction had some pretty fantastic minds behind it such as the aforementioned scriptwriter X Atencio and special effects guru Claude Coats, both Disney Legends and large parts of the creation of the Haunted Mansion and Pirates of the Caribbean. It also featured the incredible voice work of Paul Frees, best known as the Ghost Host. Finally, to top it all off, the attraction ends with the song “Miracles from Molecules” composed by the great Richard and Robert Sherman. While not one of their hit songs, it is still extremely catchy, and once you hear it you won’t be able to get it out of your head. One of the coolest parts of Adventure Thru Inner Space is the Mighty Microscope. Guests were shrunk with this microscope to go on their journey. Looking at this picture and the concept art from Micro-World, the second picture included, shows that the microscope remained a constant factor throughout the development process. What I think is one of the coolest parts is the mini-Omnimovers in the clear portion of the microscope. 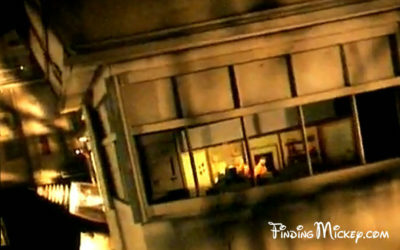 Some guests were reportedly frightened that they were actually going to be shrunk because of how convincing the illusion was. Speaking of Omnimovers, Adventure Thru Inner Space was actually the first attraction to make use of the (now Disney staple) Omnimover ride system. 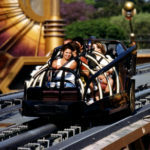 The designers wanted to find a way to increase ride capacity while also being able to control where viewers could look. One other interesting tidbit that made the attraction unique was that, when it opened, it was one of the few free attractions in the park. The park was still using a ticketing system where different attractions would cost an amount of tickets in addition to the admission that you paid for the park. Five years after opening, in 1972, the attraction started costing a “C” ticket, so still a relatively lower-cost ticket. Unfortunately, Adventure Thru Inner Space closed on September 2nd, 1985 to make room for the first incarnation of Star Tours. However, the Mighty Microscope lived on through Star Tours. …the mighty microscope is here! The love for Adventure Thru Inner Space lives on for those in the know. 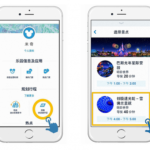 This attraction should be remembered for its innovative nature and its clever way of both teaching guests, while also taking them on a journey that they could not experience anywhere else. So that brings our tour through molecular space to a close, but not without a look at what’s coming next week. These three attractions all made their home in Tomorrowland. These attractions were all specialty attractions focusing on a single topic. These attractions were all more of exhibits than anything else. I hope you all enjoyed this tribute to my personal favorite attraction. It was fun to go back to the first post I ever wrote and touch it up a bit. 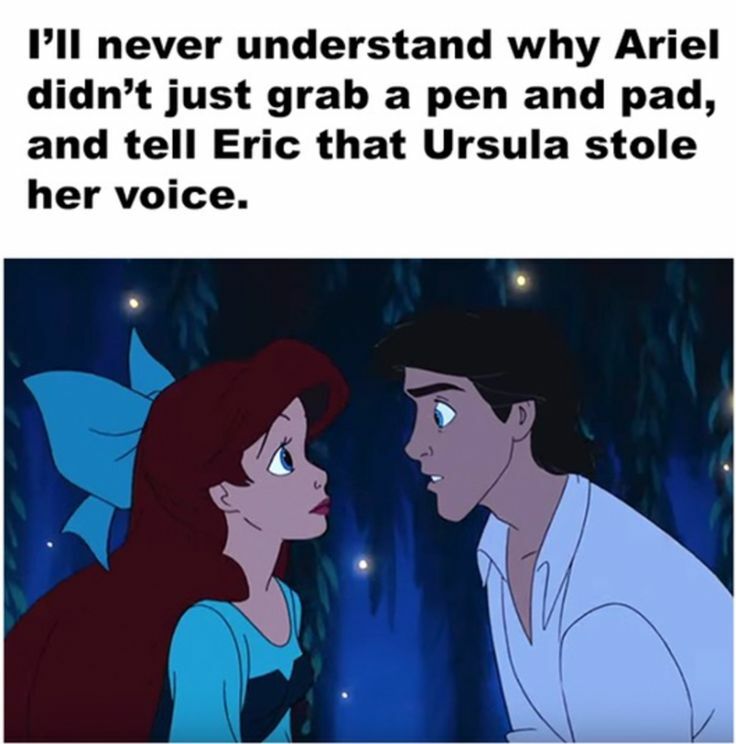 And with that food for thought, thanks for reading and have a magical day!